I was given a KitchenAid pasta press a few years ago as a gift and really enjoyed using it to make fresh pasta from scratch. I have to admit, the press doesn’t get used all that often because while it’s definitely fun to use, cleanup is it a bit of a pain. Yes, the results are great and the pasta deliciously fresh but it’s just not an every day kind of activity. Last weekend I had a bit of time up my sleeve and a craving for some whole wheat pasta so I thought “Why not?” Of course, just making pasta was the first step. I knew I’d have to compliment it with a delicious sauce and there were some strong opinions about the sauce needing to be tomato based. 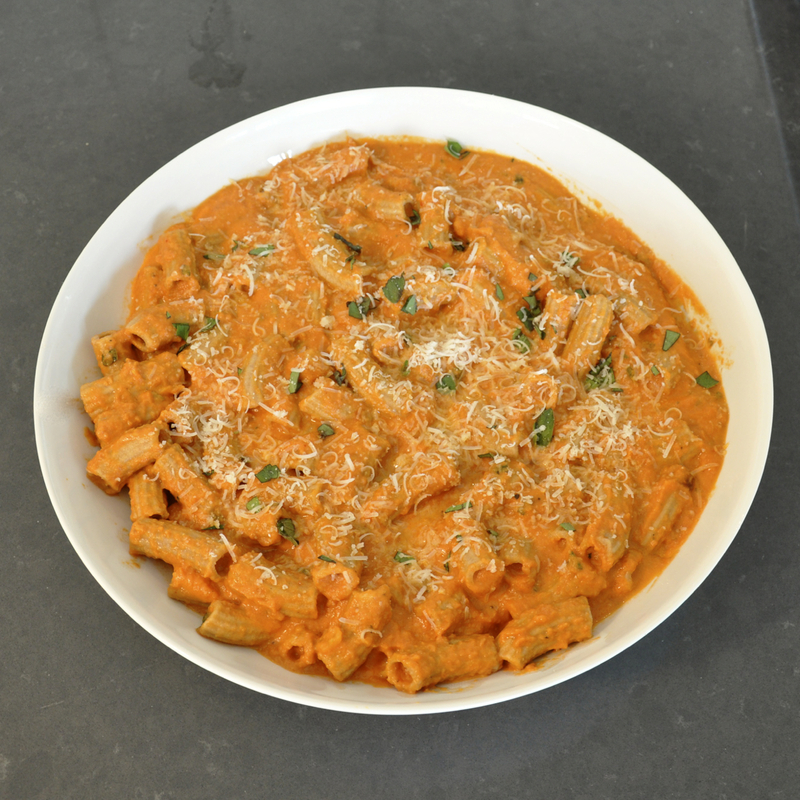 So I scoured the web looking for a recipe with my Ina Garten filter applied and lo and behold I came across this vodka-cream-sauce-like recipe published by Ina Garten titled “Nick and Toni’s Penne Alla Vecchia Bettola”. The recipe calls for Penne but I figured the Rigatoni that my extruder can make would be close enough. For so many years having pasta for dinner meant penne with a tomato based sauce. This is the kind of pasta I grew up eating and what I made for myself and my husband when we first moved in together. Don’t get me wrong, I still make this kind of pasta all the time. I even spruce it up a little with a sprinkling of basil, pinenuts and even a bit of feta cheese but that’s not what Nigella Pasta is all about. One of the things I do (and I’m sure it’s not just me) as soon as I buy a new cookbook is read (at least skim) through the thing from cover to cover looking at things I might like to make. When I do this, I’m also applying the vegetarian filter. That’s not to say that the meat dishes don’t get attention, they eventually do! Finding something vegetarian that looks suitable as a main dish for dinner, isn’t too complicated and looks tasty isn’t always so easy. When I do find something that I think will work it’s a case of “ding ding ding! Let’s get cooking!” That’s what happened with Nigella Pasta. Five years have gone by and this pasta dish still makes a regular appearance at our dinner table. The mushrooms, lemon, thyme, garlic and parmesan give this dish plenty of flavor without the need for any cream although I guess the olive oil and salt help out in that department too!